Garlic: it’s good for antioxidants, but awful for your breath. Looking for something that is milder, has the same sulfur-based benefits, but doesn’t leave its mark on you for hours after? Meet aged garlic. Also known as black garlic due to its dark appearance, aged garlic is regular garlic that has been heated and aged. The result is a soft, far less pungent tasting item that is now available, and not only in extracted Chinese medicine capsule form, but shelf-stable in whole form at mainstream grocery stores like Trader Joe’s. It’s not expensive, and its health benefits would seem too good to be true if they hadn’t already been heavily studied and backed up. It’s been available as a supplement for some time, but aged garlic’s foray into the culinary realm of the West is relatively new. The process hails from Korea and is simple: garlic is first fermented in a temperature and humidity controlled environment of 140-170 degrees for anywhere from a couple of weeks to 20 months, then left in a clean room for over a month before packaging. The result looks like roasted garlic after leaving it in the oven far too long, but the cloves are much softer. Black garlic has shown tremendous potential for patients and consumers in studies on treatments ranging from cholesterol reduction to diabetes management to aids therapy. What does this mean for healthy people? Common colds can potentially be made less common, and illnesses such as heart disease can be better prevented. 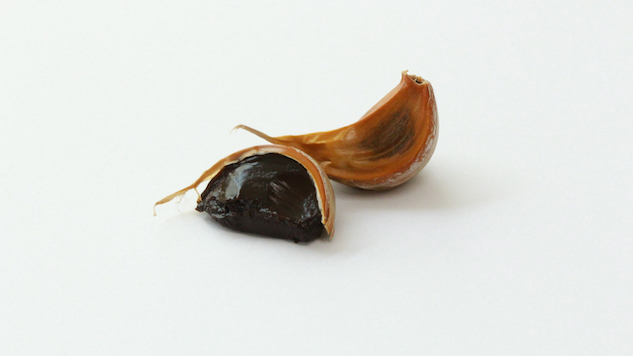 As bioavailability is greater when a whole food is consumed rather than extractions, the trend to eat black garlic is growing. Fresh garlic loses most of its antioxidants when cooked, but those in aged garlic are far more stable and can withstand cooking without becoming inert, so don’t feel obligated to use it raw. When it comes to working with black garlic, the flavor is a surprise. It does resemble roasted garlic to an extent. However, it is also a lot like dried fruit. Black garlic bears a distinct resemblance to prunes, and the texture is reminiscent of them as well. Some say it reminds them of balsamic vinegar, especially balsamic reduction or glaze. The sweetness, softness and fruity nature of aged garlic tend to throw home cooks for a bit of a loop when they try to add it to their diets. The price commitment is small, and the health benefits are large; head to your local grocery for some black garlic to wow those you love with a new dish that will help them live well. Like the idea, but hesitant to add something like prunes to your spaghetti? Here are five ways to use aged garlic that are beneficial and delicious. It’s no challenge to blend some aged garlic into a strongly flavored sauce such as teriyaki, as it mashes so easily and the soy sauce and sweet notes of teriyaki can stand up to additional flavors. If you don’t mind some texture in your teriyaki, mash several cloves of garlic along with an inch or so of fresh grated ginger. The flavors will complement one another well, not to mention ginger has a wide range of benefits itself. Given that the flavor has been compared to balsamic, black garlic can be hidden in balsamic vinaigrette. Even if you don’t try to hide it, the colors match seamlessly and the garlic’s taste won’t stand out, so add up to a clove per two tablespoons of dressing. You can either mash it and add after, or mix it in as you build the dressing in a blender. Love sandwiches? Using black garlic as a spread for bread ensures an interesting lunch. You can mash a couple cloves onto each slice of bread alone or mix mashed cloves first into a sandwich spread like mayo or mustard. Play on the balsamic notes of the garlic with fixings such as tomatoes and mozzarella, or work with its fruitiness by adding Brie, walnuts and apples for a cheese plate with some punch. If you’ve got a full pot of hardy beef or mushroom stew, squeeze in a full head of aged garlic. The umami characteristic in both beef and mushrooms will compliment the garlic, adding a unique richness to an otherwise everyday dish. Skirt steaks and chicken breasts could use some sprucing up, and filet mignon or pork loin certainly won’t complain when you rub a smashed clove or two over them before baking, grilling or roasting. For added flair, mix in flavorful herbs or use an unexpected dried herb or spice mix. We’re talking garlic, cinnamon and nutmeg pork loin, or lavender, garlic and marjoram chicken legs. Ariane Resnick is a bestselling cookbook author, special diet chef and certified nutritionist.